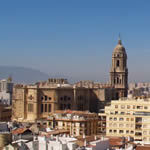 Where does paella, one of the most famous spanish foods come from? Everyone who hears of paella ( pa-eh-a ) automatically says that it is from Spain. That answer would only be half right for a real gastronomy expert. 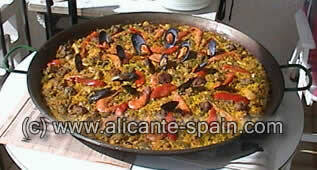 It is the typical, rich rice dish from Valencia, located on the east Mediterranean coast of Spain. Even though you can taste this food all over Spain and even world-wide, its true origin is the area of Valencia and Alicante. 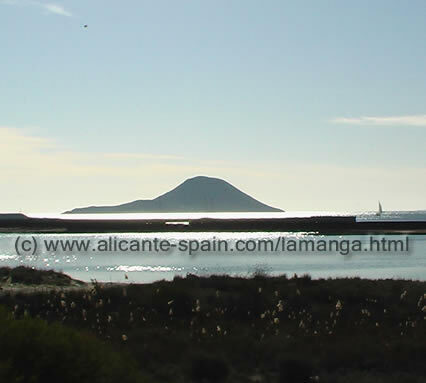 The region of Valencia and north of the Costa Blanca had and still has an extensive area of rice fields, rich soil which was always generous in producing fresh vegetables and knowledgeable farmers who raised plump chickens and rabbits, Valencia used these quality local products to make paella. Not only this but its coastal situation added its abundance in seafood and shellfish to make up another variation of it. 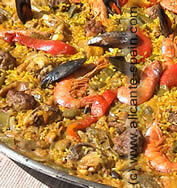 And if we add the use of the flavourable olive oil produced in Spain, we have everything necessary to make whichever paella we choose: meat and vegetable or seafood paella. But now we must choose the correct utensils to make the paella in. We do not use regular frying pans although it seems that the word is in the valencia language the Castilian translation of frying pan. Pans is a special low border frying pan about 1 1/5 inches deep and has dips in the central part like a golf ball and two rather large handles on each side. Curious, isn´t it? There are paella pans measuring from 7 inches to 1 yard wide and for special occasions for hundreds of people to eat from. The size is very important, having to know the amount of people who will be eating it to be able to choose the correct paella pan. The traditional, authentic paella probably the most well known spanish rice recipe, is still made nowadays over an open barbecue with kindling wood which, although does not seem to be so important, adds to the correct cooking of the paella. Now that we have learned a little something more about one of our favourite foreign cuisine, I would like to share the Authentic, absolutely TRUE paella recipe. First, heat the oil and when it is hot enough, add the rabbit and chicken (lightly salted ) and fry unitl lightly browned. Then add the white and green beans and cook them together with the meat. While they are cooking, make a clearance in the middle of the paella pans and fry the chopped tomatoes until they look a little pasty, quickly adding the paprika, stirringquickly and immediately adding the hot water or broth until it is almost to the top of the paella pans edge. Cook all the ingredients for about 20 minutes over a high fire and tasting for salt. After 20 minutes we add the rice, distributing it evenly, making sure the rice is covered with liquid. The fire should be fairly high, not interrupting the boil. It takes about 20 minutes for the paella rice to cook. Do not stir the rice once you have added it to the paella pans, just change its position so that the fire gets to all patrs equally. All the broth should be absorbed when finished. Take the paella off the fire and let stand for about 10 minutes covering the top with newspaper. If the rice has been cooked correctly, the rice grains should be loose, not clumped together or having a mushy texture. For a fantastic table presentation, small wedges of lemon can decorate the border and branches of romero (aromatic herbs) in the middle. Now you are ready to dig into your paella with wooden spoons and eat directly from the paela pans! In other regions and even in some of the best recipes, you will that peas and peppers are added. These are not authentic ingredients for a true Valencian paella recipe. Happy paella eating!